The text of the fragment below is unidentified; that is, unidentified by me; that is, I know something about it, but not where this text comes from. This is what I know. It is one of four parchment fragments found in a 6/7 century papyrus codex of Origen (Cairo, P. Inv 88748). These strips of parchment, taken from a codex that was by then about 200 years old, were used to provide more grip for the binding of the papyrus quire. However, Fraenkel in the Verzeichnis of manuscripts of the Greek Old Testament (p. 165-66) has more information. He gives the content of the two Genesis fragments, and identifies the third as Psalm 26:4a init. - εκζητη<σω>. I believe that he is talking about our fragment, as I can see from the second line onwards most of the first line of 26:4a μιαν ητησα[μεν παρα κυριου] ταυτην εκζητη[σω. However, this means that we have simply an ‘in-line’ citation of Psalm 26. These are the two Genesis 31 fragments, the script looks very much like our unidentified bit. I would be tempted to assume that, as there is Hebrews 12 text on the verso of the first, so also on the second. Both fragments belong together with only a single line missing in between. The original manuscript that provided these parchment strips cannot have been a continuous text manuscript, but what it was I don’t know. Any wisdom out there? Do we know of a work that combines Gen 31 and Heb 12 close together (within one folio), and perhaps also with a citation of Psalm 26 thrown in (near or far to the previous)? In a previous post on “Methodology in Transcribing Greek Manuscripts” I suggested that the use of two different base texts, Nestle-Aland and a Byzantine text like Oxford Textus Receptus 1873, for independent transcriptions of a manuscript might result in the elimination of errors resulting from the use of the same base text where transcribers would risk making the same mistake in trusting their base text too much. Only the uncials listed read περιελοντες. All the minuscules listed read περιελθοντες, as can be verified from the images on the NTVMR. The error has been reported to the editors and will be corrected in the next revised edition. Do any readers have other examples or thoughts? Share them in the comments. respectively. Last week, Review of Biblical Literature published Lee Martin McDonald’s (long-time canon scholar and recent author of The Formation of the Biblical Canon) musings on the book. Gallagher and Meade are also to be commended for their frequent use of the words “possibly” and “may be” when the evidence in their sources is not as clear as they would hope. I also want to commend them for their irenic position toward all those with whom they disagree without demeaning either the scholars or their positions. They have produced a superb volume with a wealth of information about canon formation that cannot be ignored in all future investigations of this topic. They have produced what I think may well remain the standard volume on canon lists that scholars and students alike will appreciate for years to come. I heartily recommend this impressive volume. Thanks for a gracious and helpful review, Professor McDonald! About two weeks ago I participated in a meeting in Volos, Greece, with the groups that are currently editing the Novum Testamentum Graecum Editio Critica Maior (from Münster, Birmingham, and elsewhere). We had a lot of stimulating presentations and discussions. At some point in a discussion I repeated an old suggestion I have made that independent transcriptions of manuscripts which are later reconciled (i.e., compared by software with each other and checked by a third person who resolves any differences between the files in order to create one reconciled transcription) could be transcribed from two different base texts – the Nestle-Aland text and a Byzantine text. Personally, when I worked on my dissertation on Jude I transcribed some 560 manuscripts, most of which naturally followed the Byzantine majority, and so I used the Textus Receptus (Oxford, 1873) as a base text which I then edited for each manuscript. I did not want to use the Nestle-Aland text as a base text because I reckoned I would have to edit each Byzantine minuscule much more (i.e., more work), and when editing I would also risk introducing errors. In fact, I transcribed first on paper because the computer tools for transcribing were not as good, and the paper method actually saved me precious time. I used a base text on the left side of the paper and recorded variants by underlining the text that had variation and recording the variant on the right side of the paper. The most common variants were already listed in the right margin so that I could just put a circle around the one attestested by the manuscript I transcribed ... I saved valuable "Münster-time" (yes, in these days you had to go to the INTF in Münster to collate manuscripts, there was no NT.VMR). When I came home I entered everything into the software Collate 2.0 developed by Peter Robinson (who sent me his software and manual for free – Kudos to him, I could not have done this without his software). I learnt the paper-transcription trick, i.e., to have the basetext with prepared variants on paper, from no other than the transcription master Maurice Robinson (who, to my knowledge, has not yet entered his collation data of the pericope adulterae into digitial form, but hopefully this will happen). UPDATE: Maurice informs us in a comment that all data has been digitized and he is waiting for an interested publisher. In any case, I know that the INTF have used the Nestle-Aland text as a base text for a long time, and at the meeting in Volos someone pointed out that it is actually good that the manuscript to be transcribed differs from the base text – this will keep the transcriber alert and they will do less mistakes and this may well be the case. On the other hand, there was an openness to consider my proposal to use two different base texts for the initial independent transcriptions, at least it could make for an interesting experiment. the manuscript reads ληψεως (= Byzantine text). As I proofread I found another very interesting variant in Philippians 1:14. 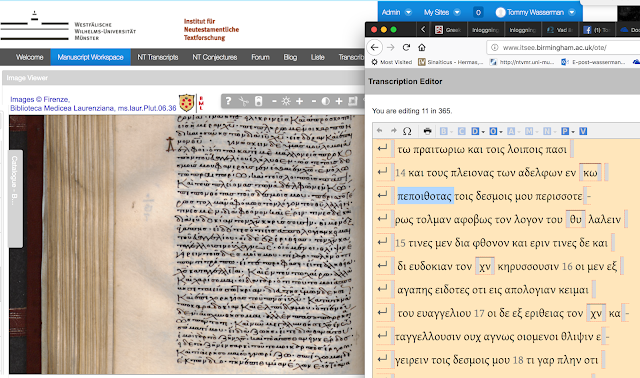 The manuscript does not read πεποιθοτας (both NA28 and Textus Receptus), but πεπονθότας. If I am not mistaken this translates, "and most of the brothers and sisters, having suffered in the Lord by my imprisonment, dare to speak the word with greater boldness and without fear." This variant is not listed in von Soden's edition. I haven't checked Tischendorf's 8th edition. In Cambridge they used to say that it only takes three years of doing something before you’ve started a new tradition. 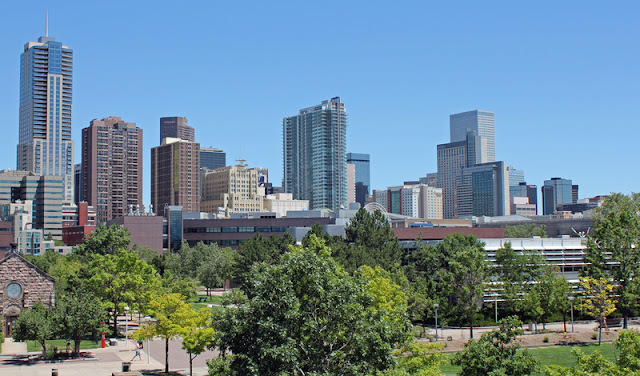 I don’t know if that’s true, but this year we are going to host our third annual ETC lunch at ETS in Denver, Colorado. Yes, we are planning to do the more famous SBL dinner as well, but we’re still working on details for that. Stay tuned. But, for those who can’t attend SBL, this lunch is a way to informally connect around two of the best things on God’s green earth: textual criticism and American fast food (you heard me right, Brits!). This year, we will plan to meet on Thursday, November 15 at 11:15am. That’s right after the business meeting. Let’s plan to meet in the lobby of the Sheraton where the conference is being held. 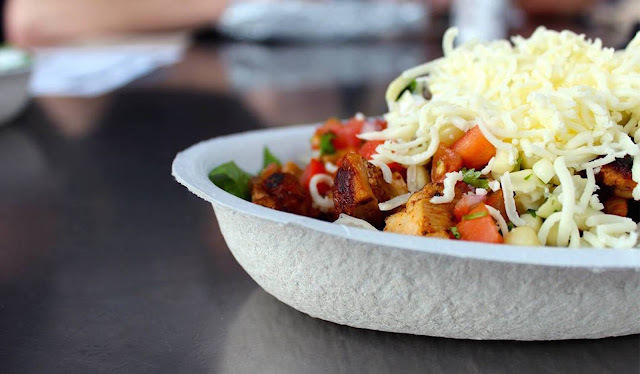 From there we’ll walk to the Chipotle at 1600 California St. If you’re late to the lobby, just meet us there. There is also a Taco Bell and a Jason’s Deli nearby if high-calorie, overstuffed burritos are not your thing. Please, do me a favor and leave a note in the comments if you plan to come. That gives us some idea of how many to look for. Hope to see you there! I cite here the following excerpt from a Museum of the the Bible press release. The Annual Meeting of the Evangelical Theological Society is coming up (13–15 November), and the schedule is online here. I did a search for the New Testament TC papers and tried to include them all with the date, time and room designation as of when I put the list together. I’m only listing the papers in each block that I think are relevant to NT TC, which is of course entirely subjective. Asterisks denote presenters who are not currently members of ETS, and I have simply copied them from the program. •9:20 AM–10:00 AM Chris S. Stevens (McMaster Divinity College) The Orthodox Corruption of Prepositions: Grammar, Theology, or Evangelical Ideology? Let me know if I missed any, and I’ll add them in. The importance of the discipline of textual criticism received an enormous boost from the discovery of the Dead Sea Scrolls showing that the study of these ancient documents is absolutely necessary for the exegesis of the Biblical literature. Textus covers that area as well as many additional ones, pertaining to all the fields that are traditionally studied by textual critics. To celebrate this occasion Brill has made the articles of the first issue free online. You can access them here. From 2018 onwards, Textus will be published by Brill Publishers with a broader mandate. 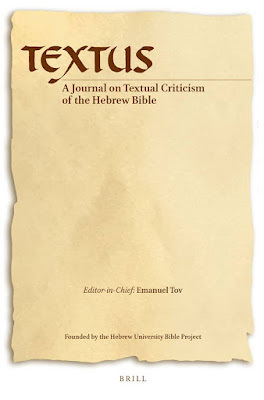 The establishment of an international editorial board consisting of recognized experts in various subdisciplines of textual criticism will ensure the high quality of the studies to be published in this journal. The journal is to be published annually. – History of research on text-critical issues. 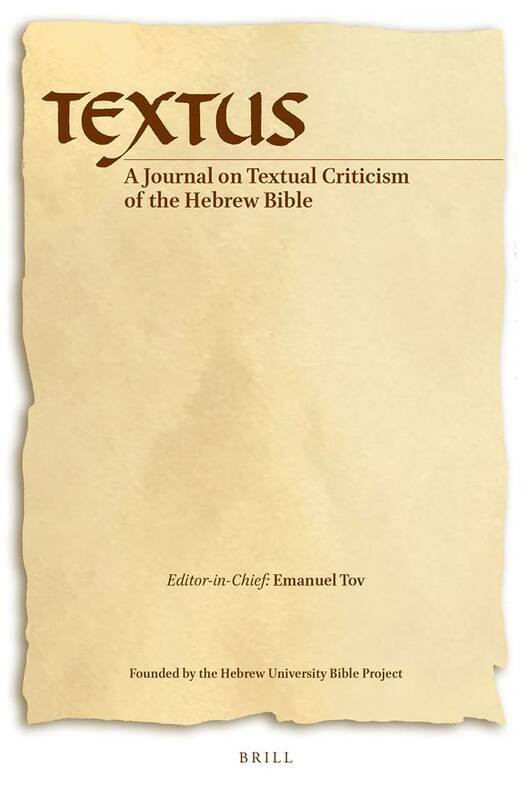 As always, I'm happy whenever there are new initiatives to publish work in the area of Hebrew Bible/Old Testament textual criticism. Brill's relaunch of Textus appears to be a welcomed addition. My Greek students have just finished a text critical assignment on the variant in Rom 1.29 involving πορνείᾳ πονηρίᾳ πλεονεξίᾳ κακίᾳ κτλ. One of the things I’ve done is compare the NA26 apparatus to the updated form in the NA28 (my NA27 is at the office). I do miss the brevity of the old version, but the new one is certainly easier to follow. What caught my attention was the treatment of Codex Claromontanus (D 06), highlighted below. The NA28 made more sense to me, but I still had questions. That led, of course, to checking the image at the BnF website. Everything in the NA28 about D now makes sense except one thing. Does D2 omit the word κακ(ε)ια? I only see what I assume is an itacistic erasure of an epsilon. So, is the (−D2) simply saying that some part of κακια (namely the original epsilon) is omitted? I assumed that the minus sign meant the whole word was omitted, which it’s clearly not. What I might have expected is something more like (⸉D). Another review of The Biblical Canon Lists from Early Christianity has appeared. Benjamin Laird of Liberty University’s School of Divinity has reviewed it positively in the most recent issue of JETS (61.3; 2018: 617–9). 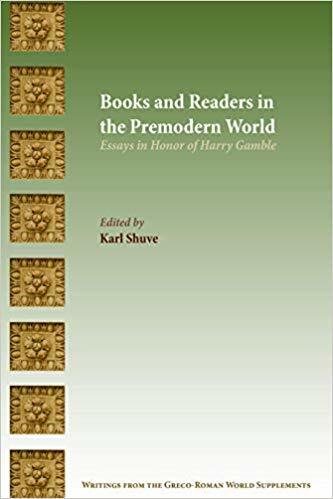 In his introductory remarks, he notes the influx of publications on the biblical canon in the last quarter century but also that there is a paucity of works “designed to serve as a resource for those engaged in the study of the primary sources” (p. 617). In his estimation the book contributes to filling this lacuna, at least as far as the early canon lists are concerned. In sum, The Biblical Canon Lists from Early Christianity is a unique, well-written, and clearly presented volume that provides both students and scholars with a valuable resource for the study of the canonical history of the biblical writings. Gallagher and Meade are to be commended for producing a definitive and up-to-date study of the early canon lists in an accessible format. The value of the book is apparent in the fact that the greatest disappointment many readers may have is that it is not wider in scope (p. 619). It should be kept in mind, of course, that because the authors focus specifically on canonical lists, several witnesses to the early state of the biblical canon receive only limited attention or are not discussed. What might be known, for example, of the state of the NT canon from the testimony of several notable church fathers such as Clement of Rome, Ignatius, Justin Martyr, Irenaeus, and Tertullian receives only scant treatment given that their extant writings do not contain explicit reference to the content of either the OT or NT in the form of a list (p. 618). He also includes a comment on Marcion to the effect that since the field has given considerable treatment to him in recent years, the volume might have included more substantive treatment of him and what his writings (known from his critics) might contribute to our knowledge of the early NT canon. Laird would have liked more treatment of biblical manuscripts than our chapter six provides. Specifically, he would have preferred more treatment of those early MSS that do not preserve the whole OT or NT such as P46. Lists are not the only means by which early Christians expressed themselves on the subject of the biblical canon. Scattered comments on individual books or groups of books pepper patristic literature. We have not seen fit to collect all these comments. Some authors of fundamental importance—Irenaeus of Lyons, or Clement of Alexandria, or Tertullian, for example—left behind nothing that could be considered a canon list, though any canon history would have to give serious attention to their statements and practice. They do not receive extended treatment here because their works transmit no canon list, a decision which demonstrates that this book is not a full canon history but a tool for such research. 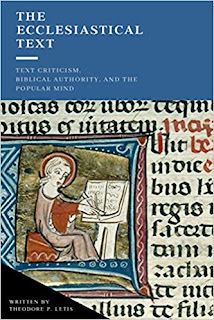 Second, it’s interesting to me that James Walters’s review of our book in Reading Religion expressed confusion over the presence of a chapter on full biblical MSS in the book in the first place and Laird would have liked more comment on them. [UPDATE 10/18/18: see Walter’s tweet thread for a helpful correction to my understanding of his review]. The former didn’t see what contribution a chapter on full MSS made for the volume, while the latter thinks that such early MSS “often contain valuable insight into the early state of the NT canon” and would have wanted more. It seems clear to me, then, that the opposing sides in the canon debate interpret the evidence of MSS for the formation of the NT canon very differently. For the one side, full biblical MSS may not tell us anything about the canon, and for the other side, they may grant valuable insight. 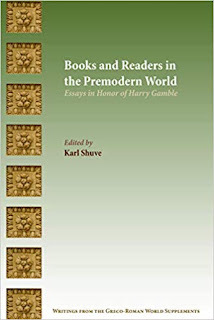 This collection of essays by leading scholars from a variety of academic disciplines explores the ongoing relevance of Harry Gamble’s Books and Readers in the Early Church (1995) for the study of premodern book cultures. 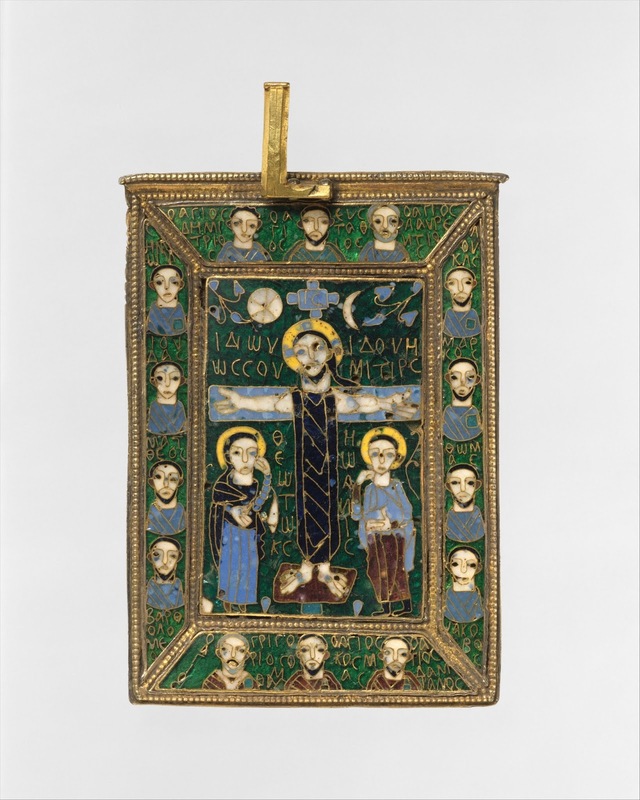 Contributors expand the conversation of book culture to examine the role the Hebrew Bible, the New Testament, and the Qur’an played in shaping the Jewish, Christian, and Muslim religions in the ancient and medieval world. By considering books as material objects rather than as repositories for stories and texts, the essays examine how new technologies, new materials, and new cultural encounters contributed to these holy books spreading throughout territories, becoming authoritative, and profoundly shaping three global religions. In this installment of the ETC interview series, we diverge from our normal practice of interviewing established text critics to interview a (recent) student. I met Caio Peres through my wife and we have corresponded for a few years online. Some of that correspondence was about textual criticism during his class on the subject with the good folks at Vrije Universiteit Amsterdam where he received his Master (Research) in Theology and Religious Studies in 2018. He currently works as a social worker for a missionary NGO in the south part of São Paulo and in this interview I wanted to hear his perspective on theological training in his native Brazil and what it was like to study abroad. Enjoy! Peter: Caio, tell us a little bit about your background and what got you interested in the Bible? What’s your primary area of research interest? Caio: I am married to Dorothee and have a four year old son, Mikael. I am Brazilian and grew up in one of the largest cities of the world, São Paulo. When I was very young my mom went through a process of conversion, so I would go to an evangelical church on Sundays since I can remember. However, there were no religious disciplines in my household. In part because my father is not a Christian, nor religious in any sense, and in part because common Brazilian evangelicals, like my mom, do not integrate their faith with everyday routines. Nonetheless, I remember that at a certain age, my mom would read a Bible verse for me in the morning at breakfast, before I would go to school. Two experiences in my life, roughly at the same period, got me interested in the Bible. The first was attending a Bible study service at my former church. The guest pastor, who is well known in the Brazilian evangelical context, was the first I saw to include some aspects of textual interpretation and theological implications. At the time this was very different from all the spiritual and life-lesson kind of approach to the Bible that I have known for a long time. It was more rational, organized and intellectually stimulating. The second was meeting my wife. She is Dutch and I met her in Brazil, when she was doing a short-term mission work at a children’s shelter near São Paulo. She comes from a family of several Christian generations. Her household dynamic was very different than mine. Christianity really formed how they lived and saw the world around them. And this was very clear in their strong missionary commitment. That made me realize how much the Bible could penetrate our own lives, but for that to happen I had to become familiar with it. These two experiences led me to commit to the study of the Bible and to missions in social ministries for children at risk in Brazil. This last development also guided my research interests. After a couple of years flirting with Reformed theology, I got hooked by Biblical Theology during seminary, and the Bible was never the same again for me. I started seeing interesting possibilities of integrating my studies of the Bible and my interest in social issues. Thus, I started to research the Latter Prophets, especially the Book of the Twelve. For reasons that I do not recall clearly, I got interested in Temple and cultic matters. So, at the moment, my primary area of research is the theology of the cult in ancient Israel, including ritual analysis from an anthropological perspective. I am especially interested in commensality and family relations in the context of the ancient Israelite cult. From a broader perspective, my aim is to understand how household dynamics and practices inform the religious conceptions of ancient Israel. Looking at these matters from my missionary perspective, this is highly important in the Brazilian context. To look at cultic practices and religious conceptualizations with an eye on family dynamics and table fellowship might be fruitful for people living in shanty towns, where broken families abound and basic human necessities, like food, are scarce. Especially because in this exact context is where we can find the highest numbers of small Pentecostal churches. Several sources today reported on an inscription dated to the Second Temple period that contained the word “Jerusalem,” but I couldn’t find an actual transcription of the three short lines. I offer my amateur attempt here and accept any correction in the comments. 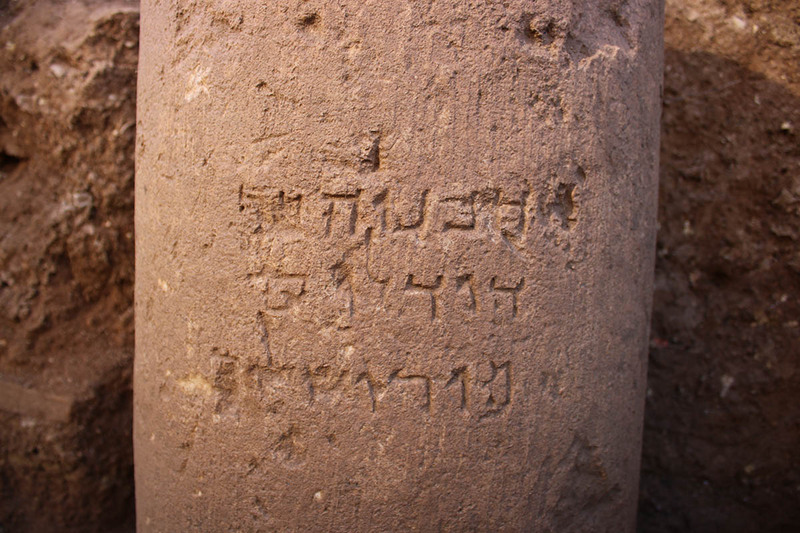 The inscription is pictured here and I took this image from Biblical Archaeology. All the hubbub here is over the spelling of Jerusalem with the ending לים -lym, which is rare in the Hebrew Bible (e.g. Jer 26:18: וִירוּשָׁלַיִם and a few other places [Esther 2:6, 2 Chronicles 25:1, 2 Chronicles 32: 9, and 2 Chronicles 25:1]), even though the Qere received and preserved by the Masoretes usually (always?) included a hireq vowel to insure it would be pronounced -ayim even without the yod in the Kethib: יְרוּשָׁלִַם (e.g. Isa 3:8). 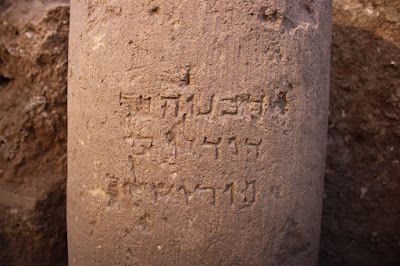 Thus what is of some interest here is that those rare spellings of Jerusalem with yod in MT are confirmed in the record at least as far back as the late second temple period and the pronunciation of the Qere, perhaps, is supported by this inscription as well. Other than that, this inscription is unremarkable on this point. I’m more interested in the apparent Greek name, Dodalos, aren’t you? And what is the actual function of br “son” in this inscription? Anyways, I’ll let others speak to these matters. 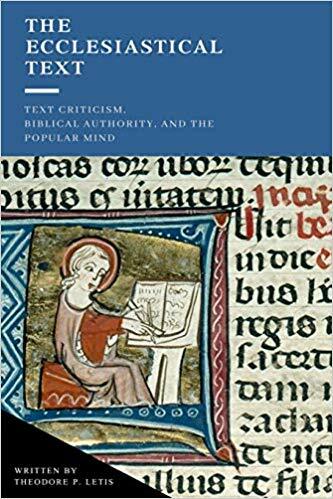 If you’re interested in the intersection of theology and textual criticism, you might want to know about a recent reissue of Theodore Letis’s 1997 book The Ecclesiastical Text: Criticism, Biblical Authority & the Popular Mind. Among other things, Letis argues in this book that the inspired New Testament text is to be found in the apographs (copies) rather than in the autographs (originals), offering a direct critique of B. B. Warfield and others in the process. For the basic argument, you can also read his article in the Scottish Bulletin of Evangelical Theology [PDF]. We’ve written about Letis before on the blog (here and here). While I don’t usually find his text-critical views convincing, I do enjoy reading him and often learn new things when I do. Although he died around 2005, some have taken up Letis’s mantle over at the website confessionalbibliology.com and their accompanying Facebook group. Sadly, the typesetting of this new edition is worse than the old one, but the $100-cheaper price tag means it’s actually affordable. There’s also a Kindle edition for $10. The International Organization for the Study of the Old Testament has posted its call for papers for the meeting to be hosted by the University of Aberdeen on August 4–9 2019. Of course, the meetings for IOSCS, IOQS, IOMS, and ISLP happen concurrently as part of this larger meeting. For general information, see the main page here. To submit a paper proposal, click here. It looks to be a wonderful time. It’s that time of year again when those presenting at the society meetings begin to panic because they now wonder how they will write those papers they proposed several months ago. At least that’s what my friends tell me ;-). The Septuagint or Greek Old Testament will be featured in a number of sessions at ETS and SBL/IOSCS. These are the main sessions treating the Greek Old Testament. If I have missed any papers that you know of, please add them in the comments. I’m disappointed to have to miss some of this session due to my own paper at 4:40 PM—5:20 PM: The Canonicity of Esther in Early Jewish & Christian Sources: A Case Study for Evaluating Canon in the Old Testament Historical Books session at the Tower Building Majestic Level — Savoy. But I hope to make some of these papers before and after my own. Abstract: Publishing “a Field for the Twenty-First Century” remains the aim of the Hexapla Project, and after many years of waiting, the release of its first edition, A Critical Edition of the Hexaplaric Fragments of Job 22–42, is planned for winter of 2018. In light of this development, I want to (1) review the aims of the Hexapla Project, (2) describe the format of the new edition vis-à-vis prior editions, and (3) reply to some recent criticism of the project with specific examples from the new edition of Job 22–42. The new edition surpasses the previous editions of Frederick Field and Joseph Ziegler both in terms of evidence and method, and this advance will be demonstrated with examples from Job 22–42. Finally, Olivier Munnich has offered some recent criticisms of the Hexapla Project, which I will address in the final part of the presentation.